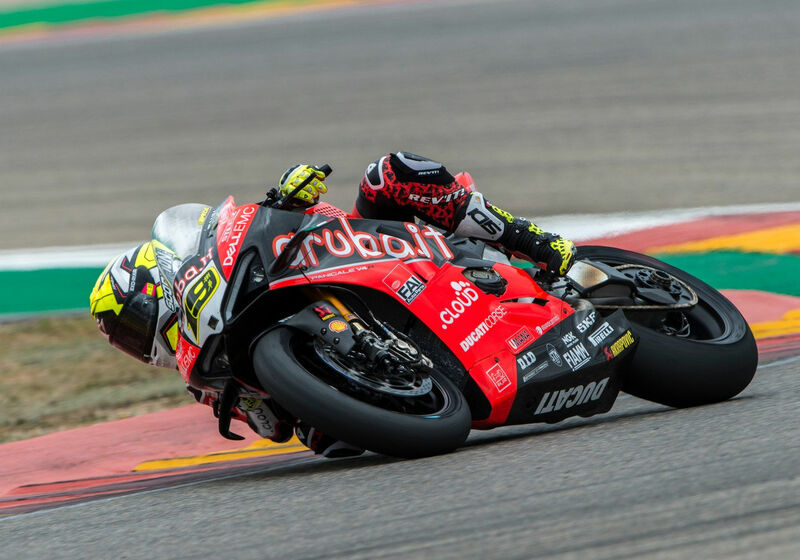 Alvaro Bautista continues to take WSB by storm aboard his new Ducati V4. After winning every race in the first two rounds, Bautista dominated the first day of practice for Round 3 at Aragon. The first free practice ended with Bautista recording an incredible 1.1 second advantage over the second quickest rider. After two practice sessions, Bautista’s fastest lap was roughly at 0.5 seconds quicker than that of Alex Lowes (Yamaha) with defending champ Jonathan Rea (Kawasaki) close behind in third. Take a look here for combined Day 1 practice results at Aragon, and stay tuned for coverage this weekend on MD. I’m confused, when Rea and Kawasaki stomped the living snot out of everybody 4 years running, I don’t remember anyone saying they needed to restrict the Kawasaki. Now that someone BESIDES Rea is winning, all of a sudden the new leader needs to be penalized, even though others running the exact same bike are not doing so well. I tell ya it’s real confusing. I suppose factory bikes are better. Then, there was no different RPM limits to each manufacturer, and this was introduced last year to stop Rea dominance. So with this ridiculous dominance from Bautista, adjust the limits, or better, REMOVE THEM ALL. It’s simple really. Ducati chose to create a bike which maximizes performance while staying within WSBK regulations. Other manufacturers could have done something similar, but chose not to. Why penalize Ducati for building a better machine? This is racing. Let them all rev out to their max. Why set a rule which restricts the bikes from achieving their ultimate performance? The rest of the field had their production bikes max rpm set before the new rpm rule came into effect. Any bike that is being produced after that,can take advantage of that rpm cap, and set their production bike to a higher rpm. What the other teams can do is, next year, set their production bikes max rpm to 16,000, or 110% above their usual max rpm. Then they can compete on equal footing. This year championship will be won by the team the rpm rule was set to favor. All the other former V2 riders had difficulty adapting to the V4R. Even Davies said so post race. “We are slowly making the bike mine,” says Davies. Alvaro had 2 years experience on the V4 in Motogp. It’s a familiar saddle to him. And it shows. Remove the rpm rule. If any team is so dominant, they shouldn’t be afraid of competing openly with the rest. The European leg for the race for 1st runners up begins. It’s not quite that simple. The rule is based on rpm above power peak, not rpm above redline. The other manufacturers would have to re-tune and/or redesign their engines, rather that just painting a higher redline on the tach. Exactly. The other manufacturers need to build “a better mousetrap” to be competitive, just like Ducati has done. Changing this rule isn’t going to do anything but possibly cut the number of factories that participate in half because some of them won’t change the rev limits of their production bikes at the expense of streetability. It’s also not a valid point until at least 3 of the Ducati’s demonstrate dominance. So far it’s one bike. The rpm rule is of no consequence. So far there is no evidence that Ducati’s rpm advantage is contributing to their competitiveness. Only one of their bikes is truly competitive, the rest are off the pace of the other leading manufacturers. Until someone other than Bautista wins with some consistency, this argument is a red herring. The difference in speed is MASSIVE. Bautista has more than 10 km/h over the next fastest bike, and today in the first race at Aragon was again a walk in the park for the spaniard. Let them all run at full capacity, the really fastest will win, and with equal rules, as should ever be. Bautista has that extra speed due to his great riding and a better machine than most of his rivals. As has been demonstrated in motoGP, Ducati knows how to build strong engines. Why don’t any of the other three V4r’s produce similar results? They are all running at full capacity under the rules. Lift all rules and restrictions and the class will die in 3 or 4 years. They are running at their full capacities and the fastest is winning (as Superlight points out). We’re it not for the one bike, Rea would be on a 9 race win streak. Until the other 3 V4r’s produce similar results, there is no reason to entertain changing anything. The speed difference is also due to his corner exit speed. Come out of the turn with the right line and at a faster speed, you can easily have a faster terminal speed down the straights. Come out of the turn slower, you need more room to hit the same speed. Also the V4R seems to agree with the tires, so Ducati got it right. Better traction=better corner speed. The other manufacturers need to up their game. About time that WSB returned Rea’s missing horsepower. Once again I have to make the point that the rules don’t favor Ducati. The rules stipulate that the race bikes can only rev a small amount above the production machine. The production Ducati has a much higher redline than the production Kawasaki. Further, why aren’t the other factory Ducatis dominating? The other pilots are slowly catching up, today Davies was third, and Laverty has done another strong race. The Panigale V4R is the closest “road” bike to a MotoGP prototype ever done, it’s logical that bautista has adapted so well to that bike, that has a huge advantage in speed. Let them all run without arbitrary limitations and the really fastest will win with justice. There needs to be limitations, or you really end up with nothing more than a second flight prototype series. Make them sell 2500 of the homologation bike, at $15K or below. Then let them use those as the basis for limited tuning, rather than the three bikes they sold to Leno for a million bucks each. But this class of sportbikes is dying out OTHER than as a basis for superbike racing…. It’s a good thing you don’t make the rules. Current model plain jane liter bikes are right around $15k. It’s 2019. It’s time you and many others start thinking in 2019 money. Look at the RC45…in 2019 money, it costs $43k. Why on earth would you think $15k is reasonable for a premier race series? $40k for a special edition bike is no longer unreasonable nor out of touch anymore. More expensive bikes have been available to the public for the whole 35 years I’ve been riding. As many others have said in the past, “Just because YOU can’t afford it, doesn’t mean others can not.” Look within if you’re not where you want to be in life and quit referring to Leno for your own shortcomings. Ducati is selling the Panigale V4 for about $20,000 to anyone who wants/can afford it. In today’s marketplace that is affordable for a top-tier sport bike. That Ducati decided to make their V4 sport bike so similar to their motoGP machine should be lauded, not criticized. Ducati is selling “a” Panigale for about $20k. “The” Panigale that is used to homologate the race spec model sells for $40k. Not affordable by any street legal standard. $15K sounds awfully cheap..how much is a new BMW S1000RR, or an Aprilia V4, or a KTM 1290 Super Duke R or a ZRX 1400? can you buy any of those new for $15K?